Earning a college degree as an adult can be challenging and intimidating, especially if it's been a while since you were last in school. 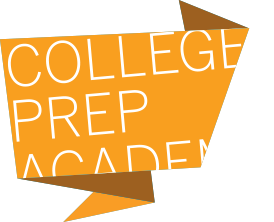 The College Prep Academy is a chance to refresh your skills and build your confidence to move forward. How does The College Prep Academy help you? At the College Prep Academy, students attend class half days, five days a week, for a full semester. The small classes focus on essential academic skills: math, reading, and writing. With the support of caring instructors and a Career Navigators, students will also learn valuable skills to help them study, take notes, and overcome test anxiety. The College Prep Academy is for adults who need to bring up their math, reading, and writing skills to a college level and pass the TSI. The Texas Success Initiative (TSI) is a college readiness test. Although the TSI can feel like a barrier to college, the real purpose of the test is to make sure students who need extra academic help, get it before they jump into college courses. How does College Prep work and what should you expect? As a College Prep student, you'll attend class Monday through Friday from 8:00 am to noon at the Austin Community College Highland Campus. 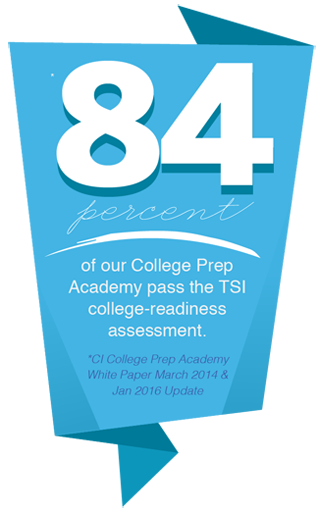 After twelve weeks of College Prep, you'll take the TSI college readiness exam. While you study hard, Capital IDEA will cover your College Prep tuition, books, and help with childcare. If a financial emergency arises, come to us. We can find resources to help with those, too. After passing the TSI, you’ll continue on as a full-time college student, and Capital IDEA will continue to cover your college tuition, books, and fees. Please note, to start the College Prep Academy you must meet a minimum fifth grade reading and math level. Austin Community College Highland Campus.